Ability: Calm : Diplomat characters may attempt to reroll a failed social attempt that might have enraged or dissuaded its intended target. Cannot be used to re-roll other players’ failed attempts. Arcane Affinity - [Race] - You have a +4 to Arcane based challenge checks. Dexterious - [Race] - Your character has a +2 to physical challenge checks. Aristocrat - [Background] - Your character has a +4 to Etiquette challenge checks. Disciplined - [Free] - Whenever your character successfully resists a CC check, they gain 1d15+5 HP. Gifted - [Bought] - Your character has a +1 to all challenge checks. Nightvision - [Bought] - Whenever your character is in an encounter where fog of war is present, their vision is increased by +2 and they gain +10 to perception. Arrogant - [ I ] - Whenever your character attempts a social challenge against another character, they will have a +4 to the threshold if that character does not have the same background as your character. Squeamish - [ I ] - When two or more enemies within 5ft of your character are killed, you must roll a challenge check of 1d30>18 to determine if your character becomes nauseous from the sight of blood. This wills stun your character for a turn. Weakness to Fel - [ II ] - (Negates Fel Tainted) Your character cannot pass fel based challenge checks. Channeling: A player may choose to channel a turn instead of casting an offensive spell or magical class ability, increasing the number of dice rolled for that ability to increase by +1. Leg Sweep: Minor Action(can also be used with other minor actions on a given turn). When used, the player may attempt to stun an enemy, non-boss, target by rolling 1d20>12. A 12+ is considered to be successful. Stunned enemies cannot walk or attack for a turn. Arcane Vortex: Using a small explosion template, the mage summons a vortex of arcane power to strike at multiple enemies. Target up to three adjacent enemies and roll 3d10+10. Arcanic Leap: The mage blinks through time and space up to 10ft to evade danger or advance in battle. May be used as an instant. Mirror Image: Summoning two illusions of themselves, the mage splits themselves apart magically to assail an opponent. Create two mirror images of the mage that lasts two turns. Mirror Images deal 1d12+2 damage and have 20HP. This is a minor action. Mirror Images count as summoned creatures and do not gain the benefit of Character Stats, items, etc. 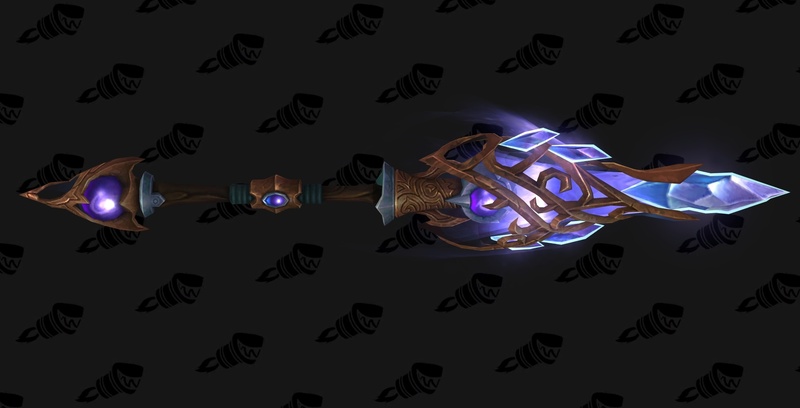 A masterly crafted staff of Shal'dorei design with a fire opal glowing like a dying star inside the wooden 'cage' at the top. Sentinel’s Vigil: The construct may activate a powerful magical shield around itself to defend it and near by enemies from powerful ranged blasts. All targets within 20ft take half damage to enemy ranged attacks for a single turn. May be used as an instant. Temporal Displacement : Allows the Construct to trade place with any other allied unit on the map. This is a minor action.